India crashed to their second defeat in the men's hockey World Cup by conceding a late goal yet again to go down 1-2 against England at the Kyocera Stadium here today. England prevailed through a 69th-minute penalty corner rebound conversion by Simon Mantell. The celebrated Indian wrestling duo of Yogeshwar Dutt and Sushil Kumar sparkled on debut in new weight categories by winning a gold and silver medal respectively in the International Competition in Sassari city, Italy. 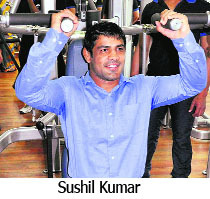 London Olympics bronze-medallist Yogeshwar won the gold medal in the 65kg category while two-time Olympic medallist Sushil won the silver in the 74kg division. From scintillating knocks to seemingly unrealistic run chases, many previous records were smashed during IPL-7. The curtains came down on the tournament quite fittingly, with KKR beating KXIP in a last-over finish in the final on Sunday. It turned out so near yet so far for Kings XI Punjab. They played fearless cricket, only to falter at the final hurdle. The seeds of Punjab's best ever finish in the IPL were sown at the auction where they cobbled together the most destructive batting line-up. Coach Sanjay Bangar was given a free hand, and he picked up players like Glenn Maxwell, Virender Sehwag, David Miller, George Bailey and Mitchell Johnson from the pool. 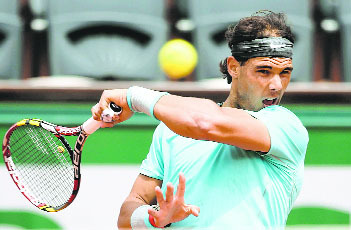 Defending champion Rafa Nadal dismantled unseeded Serbian Dusan Lajovic 6-1 6-2 6-1 on Monday to set up a French Open quarter-final clash with fellow Spaniard David Ferrer in a repeat of last year's final. Eight-times champion and world No.1 Nadal improved his Roland Garros win-loss record to a remarkable 63-1 to advance having not dropped a set in Paris this year. 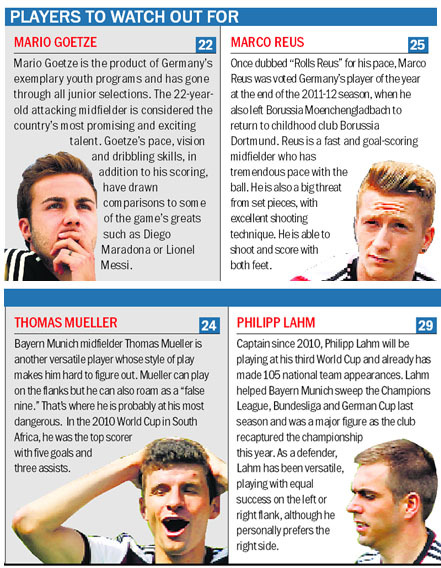 Germany are looking to end their 18-year title drought in a major competition by injecting a strong dose of youth into their World Cup squad. Coach Joachim Loew has opted for inexperienced Erik Durm, Matthias Ginter and Christoph Kramer over Marcel Schmelzer, Shkodran Mustafi and Kevin Volland in his 23-man squad. Germany have done nothing but impress since Joachim Loew took over as national team coach in July 2006 after working as Jurgen Klinsmann’s assistant for two years. Lisbon: When Portugal star Cristiano Ronaldo was awarded last year’s Ballon d’Or, he naturally had plenty of reason to celebrate although one could forgive him for feeling apprehensive about his country’s hopes at the World Cup. Portugal rely on their captain and talisman Ronaldo, who will need to defy the odds. Since the inception of the Ballon d’Or, of the 14 players in possession of the prize heading into a World Cup none have achieved ultimate success on the global stage. India had an equal run of play against England, and even saw a penalty stroke being cancelled, paving the way for England's victory. Ashley Jackson's penalty corner shot was blocked by goalkeeper P.R. Sreejesh, but Mantell capitalised on the rebound by sending a diagonal reverse shot into the net to leave the Indian players crestfallen in the dying moments of the game. India had the run of play at the start and forced their first penalty corner in the 11th minute, but failed to make it count. India mounted another move on a counter, but Dharamvir's cross could not be utilised by Akashdeep Singh in the 20th minute. At the other end, Indian goalkeeper Sreejesh padded away a shot from Dan Fox. India then came close to scoring in the 23rd minute on another Dharamvir cross to Mandeep Singh, but he sent the cross high in haste. 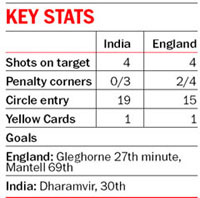 An unnecessary obstruction on the 25-yard line by Yuvraj Walmiki gave England their first penalty corner, which was converted by Mark Gleghorne with a rising shot. Indian equalised on a move initiated by captain Sardar, who put Dharamvir in possession on top of the circle and he turned around to send the shot into the net. 3 & 4) Mohit Sharma and Glenn Maxwell were the go-to men for their respective captains. Robin Uthappa was KKR’s star, with 10 successive 40-plus scores, which earned him the Orange Cap. The Karnataka dasher single-handedly changed the fortunes of his team, and KKR won nine matches in a row. He scored 660 runs at 51.18 from 16 matches, with a highest of 83* against RCB. West Indian import Dwayne Smith was the maximum man for CSK, with an astonishing 34 sixes. Smith rocked right from the first match and accumulated 566. Australia's Glenn Maxwell powered KXIP’s initial spurt with his powerful and innovative batting. With three 90-plus scores, the Victorian amassed 552 from 16 matches with 95 being his top score. Young pacer Mohit Sharma, who’s emerged as a stalwart of CSK’s bowling unit, scalped 23 wickets, to top the tables. His 4/14 against Mumbai Indians showed how much he has developed as a death bowler. West Indies mystery spinner Sunil Narine, the backbone of KKR bowling, picked up 21 wickets, flummoxing batsmen with his flight and guile. His amazing economy rate, at just above six runs per over, earned him two four-wicket hauls. Bhuvneshwar Kumar was the most impressive bowler for Sunrisers Hyderabad, ahead of his teammate Dale Steyn. At the end of the league phase, he was the joint highest wicket-taker with 20 scalps. The Uttar Pradesh pacer kept afloat his team's chances with his genuine swing. You can’t write off Virender Sehwag, whose batting has been in a decline for some time. He has not played international cricket since March 2013, and even his home franchise, Delhi Daredevils decided against retaining him for IPL-7. 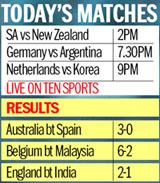 In Qualifier 2, all that was forgotten as Sehwag ripped apart CSK’s bowling to notch up a 58-ball 122. Lendl Simmons, entering the tournament as a replacement for Jalaj Saxena, made an instant impact to revive Mumbai Indians’ sagging fortunes. He struck the first century of IPL-7 during Mumbai's win over KXIP in the league stage. Kings XI Punjab had found an unlikely hero in Bengal wicketkeeper Wriddhiman Saha, who struck IPL-7's fastest century against the KKR in the final. Saha’s 55-ball 115 had almost clinched the issue for KXIP, before Manish Pandey’s blitzkrieg — a 50-ball 94 — helped KKR pull off the highest successful chase in any Twenty20 final. Glenn Maxwell's 95 in his KXIP’s successful 200-plus run chase against CSK was sheer carnage. The Australian just did not stop there and conjured another 90-plus score to knock the daylight out of Hyderabad's bowlers in Sharjah. David Warner's 49-ball 90 against CSK will also be remembered as one of the finest knocks this season. On the bowling front, Jadeja's 4/12 against CSK topped the chart, closely followed by KXIP's Lakshmipathy Balaji's 4/13 in four overs against Hyderabad in the first leg of the IPL in Sharjah. Mohit (4-0-14-4 against MI); Bhuvneshwar (4-0-14-4 against RR); Narine (4-0-24-4 against MI); and Praveen Tambe (4-0-20-4 against RCB) also produced memorable spells. Although Kings XI failed to win the title, they should still be proud of how they played throughout. “I don't think our guys can do anything but be very proud of their performance,” said skipper Bailey. Apart from signing up effective foreign players, Punjab did well to rope in good domestic talent like Sandeep Sharma, Wriddhiman Saha, Manan Vohra and Akshar Patel. For this, the credit should go to Bangar who showed an eye for talent, and then brought out the best from his players with his man-management skills. Sehwag went to the extent of putting him at par with Gary Kirsten. “Everything that you see and like about Kings XI starts with Sanjay. His knowledge of the game is wonderful, his ability to draw the younger players out of their shells to play as well as they have is phenomenal. The way he has managed the overseas players, he has just been fantastic,” Bailey said. While Punjab's success revolved largely around Maxwell's heroics initially, the whole team chipped in as the tournament progressed. Mana Vohra, Sandeep Sharma, Wriddhiman Saha, Akshar Patel…all played a very vital role. Off-spinner Patel, finishing at the sixth position in the wicket-takers list with an economy of 6.13, won the 'Emerging Player of the Tournament' award and deservedly got a national call-up for the ODI series against Bangladesh. World No. 83 Lajovic, who had not previously lost a set on his French Open debut, quickly went 5-0 down and never recovered, also losing the first four games of the second set to love. “I think he played a great tournament,” Nadal said of his 23-year-old opponent, “First time on this court (Philippe Chatrier) is never easy, the court is so big. I'm happy with the way I played today, I was able to control the points from the baseline, which is important for me. Spaniard David Ferrer registered a 6-3 6-3 6-7(5) 6-1 victory over Kevin Anderson at the French Open on Monday. The fifth seed reached his 10th straight grand slam last eight by beating the 2.03 metre (6ft 8in) South African, who towers nearly 30 cm (1 ft) above him. Battling Italian 10th seed Sara Errani survived an 81 minute first set to reach the French Open quarter-finals on Monday with a 7-6(5) 6-2 win against Jelena Jankovic, the sixth seed from Serbia. Jankovic was visibly wincing in the chair during repeated visits from the trainer who strapped and massaged her right thigh during the changes of ends, but had seemed rejuvenated as the pair went toe-to-toe in rallies lasting more than 20 shots. Left-back Durm, versatile defender Ginter and holding midfielder Kramer have only five caps between them, but all will be going to Brazil in a squad with only one recognized striker in 36-year-old Miroslav Klose. Attacking midfielder Mario Goetze played as a striker in the 2-2 warm-up draw against Cameroon on Sunday and that position can also be filled by Thomas Mueller, on target in that game. The coach, in charge of Germany for the fourth tournament, also kept faith in first-choice keeper Manuel Neuer and captain Philipp Lahm, both of whom are racing to get fit following injuries. Playmaker Bastian Schweinsteiger, also working on his fitness following several injuries this season, made the squad in a talented midfield that also includes Marco Reus, Mesut Ozil, Lukas Podolski and Toni Kroos. At the World Cup in 2006, under Klinsmann, Germany finished third. They repeated that feat at South Africa 2010. They were beaten by Spain 1-0 at the final of Euro 2008 and finished third at Euro 2012. New Delhi: BCCI’s president-in-exile N Srinivasan dropped in to meet Finance Minister Arun Jaitley in New Delhi on Monday. Although details of their meeting were not known, the Tamil Nadu strongman was at the finance ministry office during the second half where he was with Jaitley for about half-an-hour. Srinivasan was unavailable for comments about what transpired during the meeting. While he relinquished his BCCI vice-president’s post due to political commitments, Jaitley is one of the respected voices in the BCCI and was also the president of the Delhi and Districts Cricket Association sometime back. Dubai: Sri Lanka off-spinner Sachithra Senanayake has been reported for suspected illegal bowling action during his side's seven-run victory over England in the fourth One-Day International at Lord's Saturday. The umpires' report cited concerns over a number of deliveries that were considered to be suspect. Senanayake's bowling action will now be scrutinised further under the ICC process relating to bowlers reported in Tests, ODIs and T20Is. New Delhi: Sports Authority of India (SAI) is seeking an additional Rs 80 crore from the newly-formed government to meet the athletes' requirements ahead of Commonwealth Games and the Asian Games. SAI secretary Neeraj Kansal said the nodal agency had written to the sports ministry for the amount over and above the Rs 165 crore allocated to the National Sports Federations (NSFs). A total of Rs 1219 crore was earmarked for sports in the interim budget. Bangalore: Attributing Kolkata Knight Riders’ second Indian Premier League title triumph to Gautam Gambhir’s leadership skills, the team’s bowling coach Wasim Akram said he is the best among all the IPL captains this season. “It means a lot to the team when the skipper is performing well. It adds to the security and the self belief. He has led his troops very well. I believe he was the best captain in this IPL,” said Akram. Mumbai: India's top batsman Virat Kohli on Monday won the Ceat International Cricketer of the Year award while off-spinner Ravichandran Ashwin, the fastest player from the country to pick 100 Test wickets, bagged the Indian Player of the Year award for 2013-14. Shikhar Dhawan was named the International Player of the Year while Robin Uthappa, who was part of the triumphant Karnataka Ranji Trophy team, clinched the Domestic Cricketer of the Year honour at a function held in Mumbai on Monday.